Despite the unseasonably cold temperatures, I decided to grill a boneless, skinless turkey breast. I have never done that before, and I didn’t want it to dry out. Instead of marinating it, I decided to use this marinade injector that I had bought once upon a time, but never used. Also, I didn’t feel like doing a classic Italian/garlic/lemon/herb taste for my first go round. After perusing the site for a while, I decided I wanted to make a giant grilled Buffalo-wing-style turkey breast on the grill. Side note: “Buffalo” chicken wings have nothing to do with buffalos. They originated in Buffalo, NY. The wings were first prepared at the Anchor Bar by Teressa Bellissimo, who owned the bar along with her husband Frank. There are many stories surrounding the exact circumstances of their creation. However, none of them is substantiated. It doesn’t really matter how they originated; they are delicious. Classically, the wings are deep-fried in oil (although sometimes grilled or baked) . They are then drained and coated with a sauce made of Louisiana (cayenne pepper) hot sauce and melted butter. Instead of coating the turkey after the fact, I decided to inject the Buffalo hot sauce before I grilled it. Injecting the Buffalo hot sauce. I let it sit a while to let the marinade infuse into and distribute throughout the meat before I grilled it. After grilling, I melted some gorgonzola cheese over the whole thing. It was delicious. 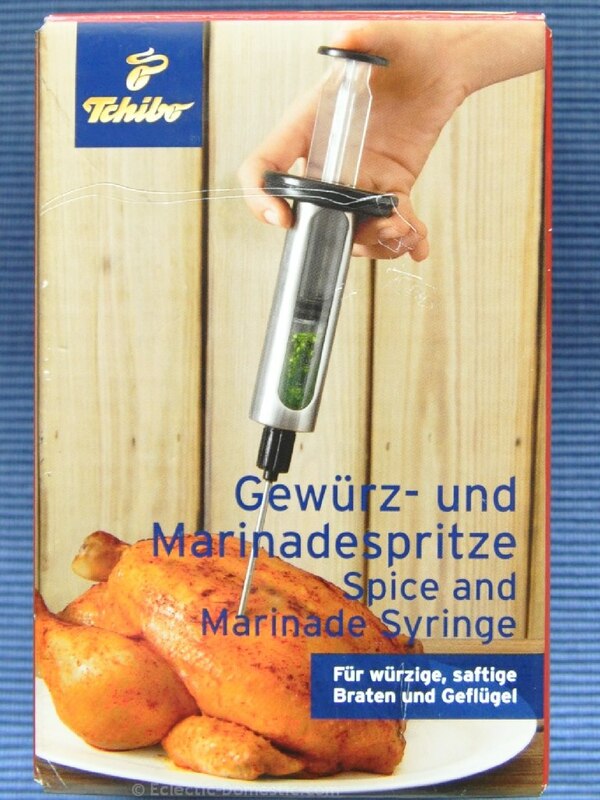 I suspect the whole thing can also be made with just a marinade if you don’t have an injector. However, I would use significantly less butter in that case to avoid fires on the grill. An inside-out over-sized version of Buffalo wings made with a boneless, skinless turkey breast. Rinse turkey breast with cool water and pat dry with paper towels. Place in a baking dish or plastic container (something with a high enough rim in case any of the marinade overflows). Fill injector with Buffalo sauce. 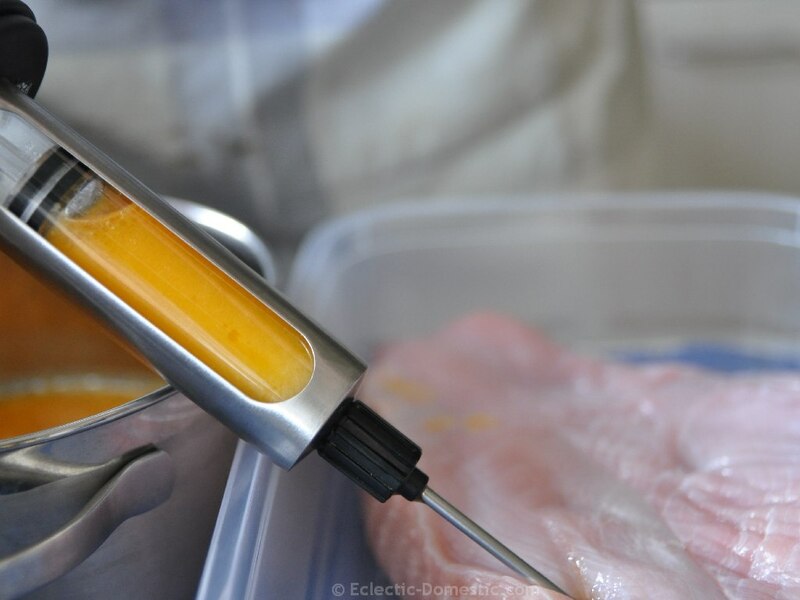 Carefully insert the injector into the middle of the meat and depress plunger slightly as you pull it up slowly. Reduce plunger pressure as the needle comes nearer the surface of the meat (so meat can close up behind the needle.) Do not pull the needle completely out of the hole unless to reload with sauce. Use the same hole to angle into the other areas of the meat. If the liquid spurts out on the meat surface, spread it over the surface of the meat. Pour remainder of sauce over top of turkey breast. Let turkey stand to come to room temperature before grilling and to give the flavor time to infuse through the meat. Grill until the breast reaches and internal temperature of 74 °C (165 °F). It should be firm to the touch but not rubbery. Transfer turkey breast to an oven-safe dish, turn off grill, and place turkey and dish back onto grill. 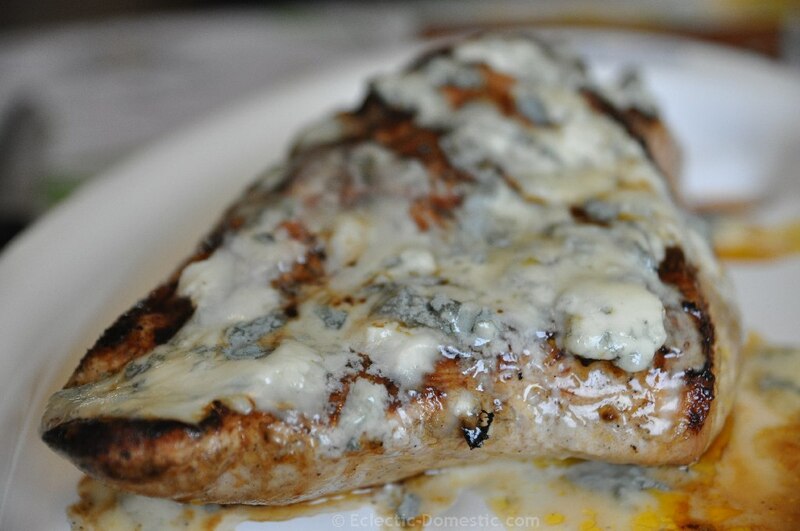 Scatter crumbled blue cheese over the turkey breast and either cover with foil or close cover of grill. Let stand for 5 minutes until cheese is melted. Prep time does not include standing time ("marination"). Tip: Serve with a tossed green salad or raw veggies. Yum. Naved has been grilling fennel bulbs recently and I made a tarragon, mint vinaigrette to serve with them – yummy!